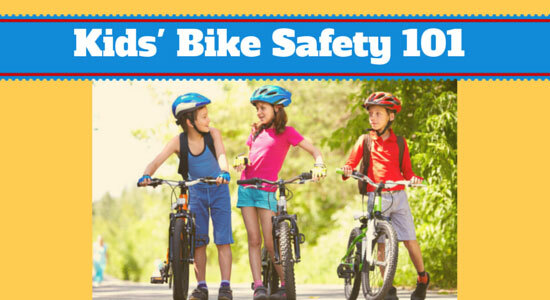 Note: this is the first in a two-part series on children's bike safety. You can read our second blog post, featuring safety tips for when kids are on the road, here. Pick the right size bicycle. 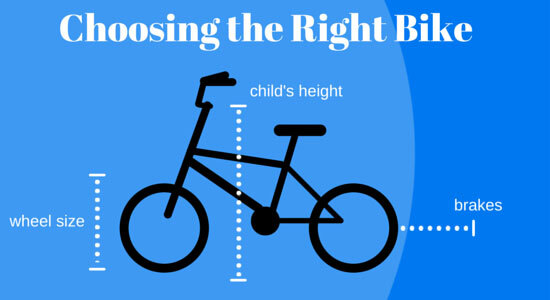 Kids' bikes are sized by the wheel, and you should choose a bike based on your child's size, not age. Have your child get on the bike to see if it's a good fit. According to bike safety experts, you want your child's knee to be about 75% extended when the pedal is in its lowest position. Experts also recommend having your child straddle the frame of the bike. He or she should be able to comfortably put their feet on the ground, and there should be a 1-2 inch gap between the child and the top bar of the frame. Never buy a bike that your child can "grow into." This might seem like a good investment but can be very dangerous. Think about the brakes. Brakes are the most important mechanical part of the bicycle. Kids' bikes come with two different kinds of brakes – coaster breaks (which are engaged when the child pedals backward) or handbrakes. Because of kids' limited hand strength and small hand size, many children's bikes come with coaster brakes. Until a child's hands are strong and big enough to use a handbrake, stick to coaster brakes. Once you have the bike picked out, it's time to move on to safety gear. More children ages 5-14 go to emergency rooms for injuries involving bicycling than any other sport. The good news is that from head to toe, there is safety gear that can help keep you child safe on a bike. Helmets – Helmets can reduce the risk of severe brain injuries by 88%. However, only 45% of children ages 14 and under usually wear a bike helmet. Make sure your child wears the helmet every time they're on a bike, scooter, skateboard or skates. The helmet should meet the U.S. Consumer Product Safety Commission's standards. Make sure the helmet fits properly. It should sit on the top of your child's head in a level position. It shouldn't rock forward, backward, or side to side. The straps should always be buckled. EYES: Put the helmet on your child's head. The bottom rim of the helmet should be visible when he or she looks up. The rim should be one to two finger-widths above the eyebrows. EARS: The straps of the helmet should form a "V" under your ears when buckled. The strap should be snug but not too tight. MOUTH: Have your child open his or her mouth as wide as they can. The helmet should be snug on their head. If not, tighten the straps a bit. Lights and reflectors – Daylight riding is your safest bet. However, if your child is on his or her bike at dawn, dusk, or in the evening, lights and reflectors are a must. The headlight should be visible for 500 feet, and you should attach rear reflectors. Safe clothing – Kids should wear bright clothing when they ride a bike. The more they can stand out from their surroundings, the better. Clothes should be form fitting and free of straps – things such as loose pant legs and backpack straps can get caught in the bike chain. Kids should wear sneakers when they ride – not sandals or cleats – and they should never ride barefoot. Make sure shoelaces are tied properly. No matter how much you prepare, accidents still happen. Reckless drivers, equipment defects, and dangerous conditions can disrupt even the most careful planning. If your child was hurt in a bicycle accident, we're here 24/7 to answer your questions. "Bike." Safe Kids Worldwide. May 18, 2015. "Bike Safety." Kids Health. February 2014. "Bike Safety – How Parents and Kids Should Pedal Their Way to Bike Safety." About Parenting. May 19, 2015. "Bike Safety Tips." Safekids.org. May 18, 2015. "Children: Choosing A Bike / Buying a Bike." International Bicycle Fund. May 18, 2015. "How to choose a bicycle for your child." The Washington Post. May 29, 2013.